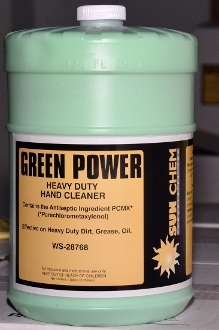 Green Power Hand Cleaner is the original "old School" Heavy duty Hand Cleaner used to remove stubborn industrial soils from hands in every type of work including print shops, factories, and municipalities and where ever hands get dirty. It is especially useful in: airport terminal services, animal hospital & veterinarians, cleaning and maintenance services, truck & auto repair shops, machine shops, industrial manufacturing, bus & transit authorities, school systems, and wastewater facilities. Sun Chem has been used for over 15 years and is the top choice for cleaning hard-working hands. Its combination of solvents, detergents, and pumice effectively removes industrial soils. Green Power is also phosphate-free and contains emollients, meaning that it is milder on skin than standard heavy duty industrial hand soaps. Its fragrance leaves hands with a pleasant almond smell. The one gallon size is designed for use with Flat top gallon Dispenser Ws-61128. • Green Power includes a solvent, detergent, and pumice blend to supply a penetrating cleaning action. • Especially formulated for removal of stubborn industrial soils, grease, grime, ink, resins, adhesives, tar, carbon, and asphalt. • While it is a strong grease remover, Green Power is also contains lanolin and other emollients to work against chapping and drying of hands. • Rinse completely, quickly and easily from hands.